The best reminders are ones that come with an instant solution. With Alarm.com, that's simple. Actionable Notifications are one of the most exciting features of our new Apple Watch app, and this feature is now available with our iPhone app and coming soon to our Android app. They let you take care of something you forgot to do back home in a single touch. Did you leave your garage door open when you left for work? 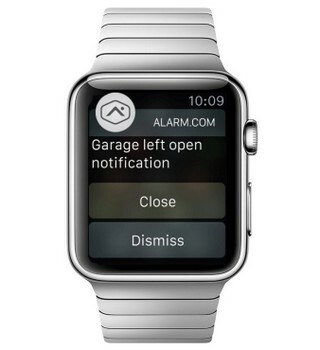 You'll get a notification on your wrist with a button that allows you to close the door instantly. With a glance and a quick tap, your home is secure. When combined with our exclusive Geo-Services location based automation, these alerts offer the ultimate in home security. Using your location as a trigger, Geo-Services from Alarm.com alerts you if you've left your home without securing it. From the alert - either a pop-up or a message in the notification center - you can secure it right away, wherever you are, without opening the Alarm.com app. Protecting your home begins with professionally monitored security, and arming reminders will help make sure your system is always on when you're away. Just tap the button to arm it and protect your home. This one tells you that you left a door's smart lock unlocked. Tap to lock it! Hey, you left the garage door open. It's easily done. Tap to close it! To take advantage of the new alerts, you'll need to turn these rules on in your Alarm.com app. For a quick explanation of Geo-Services, click here.